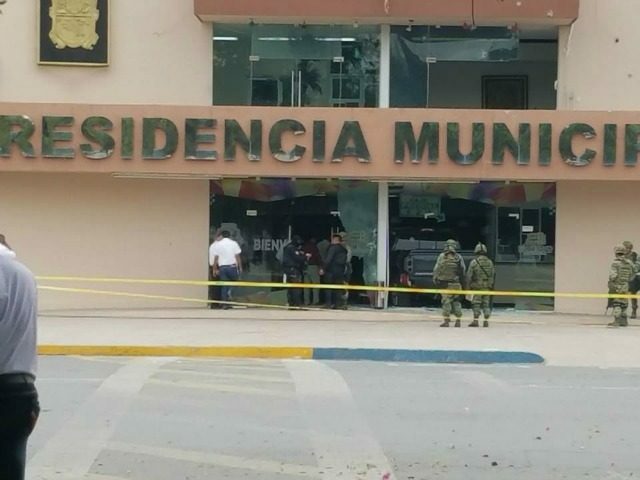 RIO BRAVO, Tamaulipas — Cartel gunmen trying to target a local public official brazenly roamed the streets of this border city firing weapons outside of the mayor’s office. Security footage from the attack reveals the moment when a team of cartel gunmen chased and fired automatic weapons at local farming secretary Carlos Alejandro Castillo Perez. The city official tried to flee and crashed his black SUV into the mayor’s office in an attempt to get away. Rio Bravo is immediately south of Donna, Texas. In the video, at least two SUVs carrying cartel gunmen are seen chasing Castillo’s black vehicle as it eventually drives into the building. Police arrested Castillo after he crashed the vehicle into the building. Initial information had pointed to authorities chasing the black SUV, but that information has since been clarified by the Tamaulipas government. Preliminary information provided to Breitbart Texas by Tamaulipas law enforcement revealed that Castillo’s SUV was armored with a handgun inside. In Mexico, the possession and carrying of weapons are highly restricted. It remains unclear if Castillo’s handgun was legal. Tamaulipas law enforcement officials revealed to Breitbart Texas that the gunmen targeting Castillo are believed to be part of the Gulf Cartel faction led by Luis Alberto “M-28” or “Pelochas” Blanco Flores, a lieutenant waging a war for control of the border city of Reynosa and surrounding areas. The ongoing struggle led to more than 140 murders and almost daily shootouts, Breitbart Texas reported. A second video previously published by Breitbart Texas reveals the moments after police officers arrived at the mayor’s office and fought off the cartel gunmen, who managed to escape. Editor’s Note: Breitbart Texas traveled to the Mexican States of Tamaulipas, Coahuila, and Nuevo León to recruit citizen journalists willing to risk their lives and expose the cartels silencing their communities. The writers would face certain death at the hands of the various cartels that operate in those areas including the Gulf Cartel and Los Zetas if a pseudonym were not used. Breitbart Texas’ Cartel Chronicles are published in both English and in their original Spanish. This article was written by “A.C. Del Angel”, “J.A. Espinoza” and Francisco Morales from Tamaulipas.